Woohoo another post for you :D I feel like I'm finally back to my blogging self! I must admit this year has been pretty crazy, but at the same time really amazing. I have never been the best at organising my time haha, so to be able to be doing more regular posts again really does make me feel happy. Today's post is going to be about quite a new Korres Lip Butter, and with winter looming I thought it would be a great idea to post about this product. Every October I feel my lips starting to dry, and before I know it they are super chapped and just erghhh! So I'm always on the look out for new lip products to help keep my lips in tip top condition. If you have read my blog for a while you will probably know that I had my own lip balm brand called Jewel By India R. I am still working on the business, but with work and my uni taking up so much time I felt like I was starting to spred myself a bit thin. I have so much time to develop my brand, so its something I'm looking forward to doing in the future. Anyway! enough with my rambling haha :) I hope you enjoy the review! 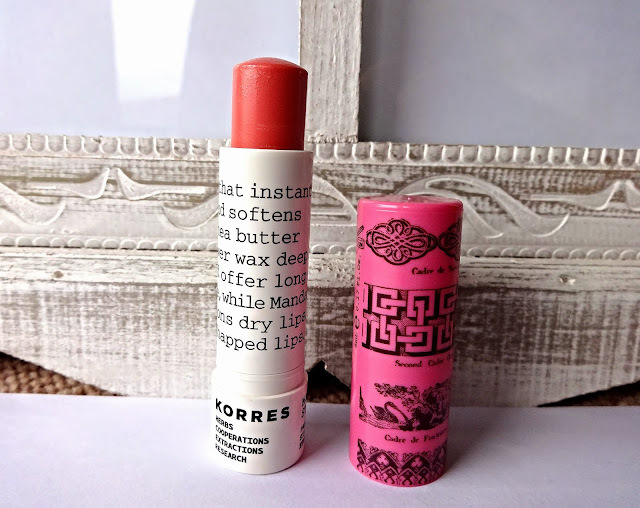 After falling in love with my Korres Potted Lip Butter in Guava I was quite excited to see a new and more travel friendly Korres Lip Butter. I choose the Pink shade which uses Mandarin Oil to soften the lips, as well as including all of the traditional ingredients such as Shea butter and sunflower wax. The design is also quite cool, and I like the type writing style on tube. However, I have been left underwhelmed by this product. I have become used to the melt in my hand kind of texture that the potted version offers, but this just isn't the same. When I apply it to my lips they don't feel super nourished, but instead leave my lips feeling quite dryish even after applying the lip butter. I think for £8.00 I was expecting a more comfortable and less hard texture to this lip butter. I have a feeling the SPF ingredients may be why it isn't as moisturising as the potted version, and obviously as its in tube form it does have to have a harder texture to stay in shape. Despite it not being as good as the potted version the colour it gives my lips is Ahhmazing! it makes my lips turn into a beautiful dusky rose, which is so flattering for the Autumn time. It is also very hassle free and non messy in comparison to the potted butter, so it makes it good for me to take to work, as I get a bit of colour and moisture at the same time. I do like this product, but for the price I was expecting it to be a lot better! so I won't be re purchasing. I would say that the Revlon Lip Butter's are a better option for a similar price, and they keep my lips feeling softer for longer. I was trying to figure out if I should get this because I hate bringing around a potted lip balm in my bag. I think I'll wait till summer after reading this though, because my lips are in need of serious moisture recently. I've thought about getting one of these as I really like the tub versions but I'm not too sure now, it certainly doesn't sounds as good.